If you follow me on instagram, you probably know I have a problem. An insane insatiable urge for Maison Kayser's Pistachio White Chocolate cookies . They are soooo good. And since they opened a bakery right...in...my...office building, it's really becoming a problem. It's like a daily craving.. oh, it's 3 o'clock? Time to get a cookie! And at 4 bucks a pop, this addiction is slowly killing both my wallet and my waistline, all in one fell swoop! 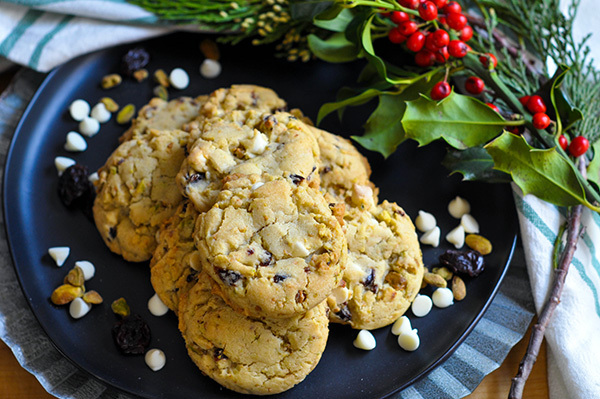 So, in an effort to relieve my cravings on days I'm not in the office and combat my shrinking wallet (note, however, this does NOTHING for my pants size) I tried to recreate the experience at home with these Pistachio White Chocolate Cherry Cookies. They come pretty darn close without reaching the extreme butter/sugar amounts that I suspect are in the real thing, plus I added dried cherries to balance out the sweet white chocolate. Perfect for Christmas or just a Monday. These cookies are my new addiction.